You will receive a morning visit from Jeanne the morning after you fix Sam's shop in Beacon Town. She will ask you to fetch her 7 Celery, which you can now buy the seeds from Sam. Grow the crop and bring her what she requests by talking to her and then accepting the "Give the requested item?" prompt. After that, you will start to receive bring-me-this type of request from the other villagers. In the morning you may see an icon hovering over your mailbox by the front door of your house. The villagers will send you letters containing an explanation as to their problem and what you can bring them to solve their issue. The items they will request range from easy (wild flowers) to more difficult (cooked recipes). 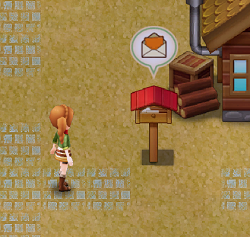 Once you collect the requested goods, talk to the requester villager to hand them over and receive a reward. Most requests can be completed by handing over a higher-quality good than what the requester is asking of you. For example, when Melanie requests you bring her 2 Wool, you can bring her 2 Great Wool or a higher-quality version. The game will display a notice that you have a better quality of item and asks if you want to give it. If you select "yes," then you'll hand the item over. If you do select "no," then you won't hand anything over to complete the request. Requests that will accept higher-quality goods will need to be completed in full using that quality. For Melanie's 2 Wool example, you cannot complete the request with 1 Wool and 1 Great Wool; you have to use two of the same quality. Villagers will give you one request to work on for them, although with multiple villagers you may have multiple active requests. You can see your list of requests by accessing your Y Menu and then selecting the Request letter icon. You can page through your active requests, your completed requests, or a combined list of active and completed requests. As you finish each one, it will move over to the completed list. Each villager has a specific number of one-time requests they assign to you, each one a little more challenging than the one before. Marriage candidates have a total of 10 regular requests, and villagers have 8 regular requests. More requests will appear after you complete their normal fetch requests. These new requests are seasonal requests, with each villager having two versions each season that will randomly appear in your farm mailbox. Just like with the regular requests, you cannot manually cancel a seasonal request to trigger a new request. The requests have a priority level, from bachelorettes, to bachelors, to the villagers, and finally the deities. If you're trying to get the deity requets farther down the request list, then you'll have to receive the higher priority requests and then not complete them so the game will assign the next lower request in the list of possible requests. For example, if you're trying to get Sally's requests and you complete all of the bachelorettes' requests, the next morning you may end up with another request from a bachelorette since their spots are available in the list of requets. Cyril's Country Life 8 reward you with 10 Cranberry Seeds. Alligator Gar is a fish caught during Summer in the mountain pond by the Harvest Goddess Spring when using Tropical Feed (after 11am works best). The materials to complete these requests come from using the Windmill. Gareth's Inquiry 8 rewards you with 5 Tropical Feed. Banga Cauda is a recipe awarded for completing Bastian's Farm to Table #7 request. The rewards for completing the deities requests is the Blissful Bread recipe, a cooked item you make in your kitchen that when eaten, permanently increases your stamina heart by 1. Making Blissful Bread requires 2 Blessed Flour. You can increase your stamina to a maximum of 10 hearts. The deities only have 5 normal requests each. After the initial 5 requests, they will give repeatable seasonal requests just like the other villagers do. Michelle and Shirlock do have requests, but their request priority is below the deities. To get their requests to appear you'll have to leave everyone else's requests unfinished until the game finally sends you the lowest-priority Michelle and Shirlock requests. These two characters are optional download content for the Special Edition of Light of Hope.